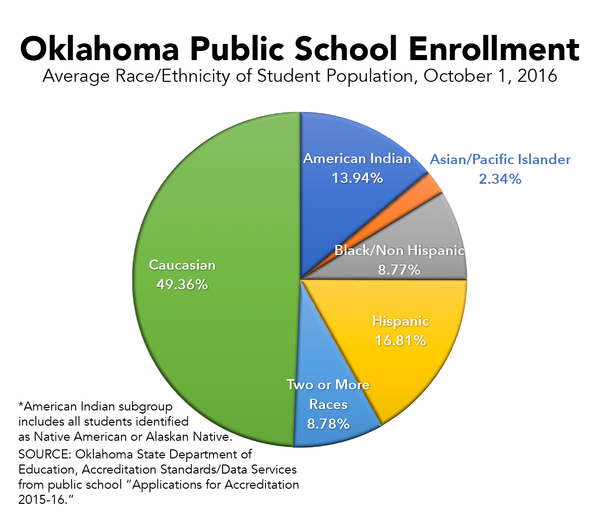 OKLAHOMA CITY (Jan. 18, 2017) – The number of students enrolled in Oklahoma public schools continued to rise in 2016, increasing by more than 1,000 from the previous year. A total of 693,710 students were enrolled in pre-kindergarten through 12th grade at the start of the school year, an increase of 1,040 over the 2015 total of 692,670 and 27,560 more than in 2011. State Superintendent of Public Instruction Joy Hofmeister said the increase in enrollment does not come as a surprise. “Oklahoma schools are educating more students than ever before. Over the past decade, student enrollment has risen steadily, as have funding challenges. We must do everything we can to maximize our resources in order to serve a growing and increasingly diverse group of Oklahoma schoolchildren,” Hofmeister said. 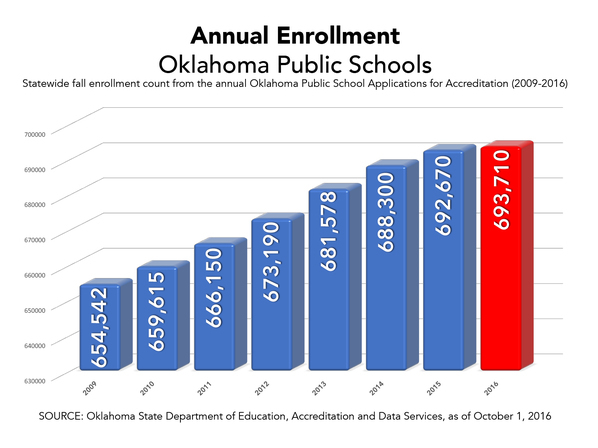 Districts record enrollment every year on Oct. 1 and report the figures to the Oklahoma State Department of Education. 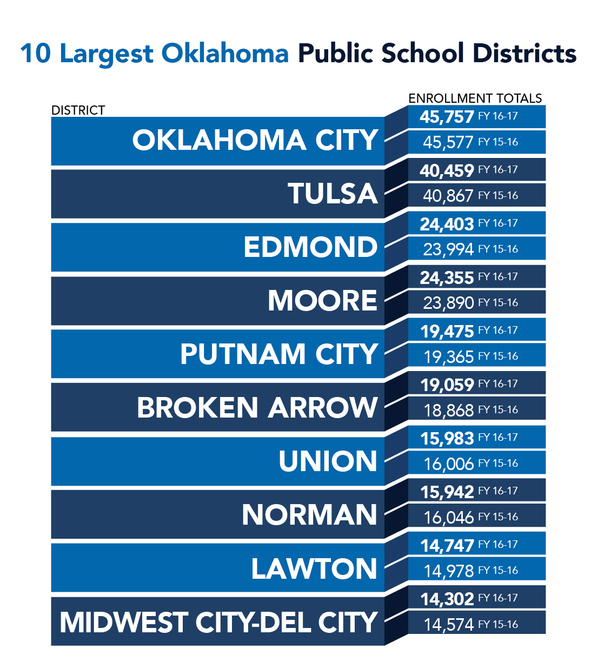 Currently, Oklahoma has 513 public school districts and 1,787 school sites, including 13 charter schools not sponsored by a district. Among those districts, Moore had the greatest year-to-year growth, increasing 1.95 percent over 2015, followed by Edmond with an increase of 1.7 percent and Broken Arrow, which jumped 1.01 percent. Putnam City and Oklahoma City grew less than 1 percent. Enrollment decreased up to 2 percent in Union, Norman, Tulsa, Lawton and Mid-Del. *Numbers are rounded and may not add up to 100.